In addition to its Career Day, Career Services is hosting two Speed Networking sessions for students on Sept. 25 to help students perfect their handshake and practice their elevator speech with employers in a fun and fast way. 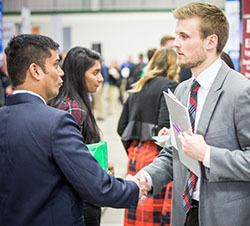 Northwest Missouri State University Career Services will host its annual fall Career Day and Education Expo Tuesday, Oct. 2, for students to network with potential employers and graduate schools. The Career Day will be 11:30 a.m. to 3 p.m., and the Education Expo is taking place from 8:30 a.m. to 10:30 a.m. Both events will be at the Carl and Cheryl Hughes Fieldhouse. 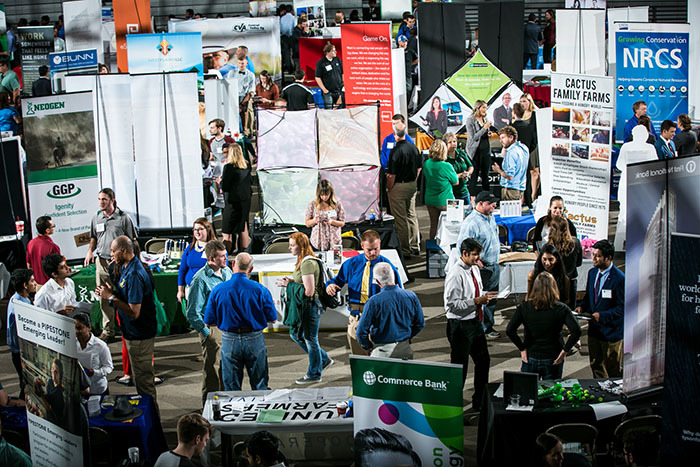 Career Day provides students with an opportunity to connect with employers regarding full-time, summer and internship positions. The Education Expo is designed to connect new and alumni teacher candidates with prospective employers. Graduate Schools also will be in attendance to share information about degree programs and graduate school opportunities. More details and a listing of employers and schools is available by clicking here. To help students prepare for Career Day, Career Services will host two Speed Networking sessions at 1 p.m. and 4 p.m. on Tuesday, Sept. 25, in the J.W. Jones Student Union. Speed Networking is a one-hour event designed to help students perfect their handshake and practice their elevator speech with employers in a fun and fast way. Career Services also will host its annual Mock Interview Day from 8:30 a.m. to 4 p.m. Tuesday, Nov. 13, in the Student Union. The event helps students gain interviewing experience by meeting face-to-face with real employers who provide students with direct feedback on their résumé, interview responses and overall impression. At Northwest, 97 percent of bachelor’s degree earners and 99 percent of master’s degree earners secure employment or continue their education within six months of graduation, according to the most recent data. Zippia, a career website, has named Northwest the best college in Missouri for getting a job. For more information about Career Day, Education Expo, the Northwest Graduate Information Fair or any of the available services at Career Services contact at 660.562.1250 or www.nwmissouri.edu/career.